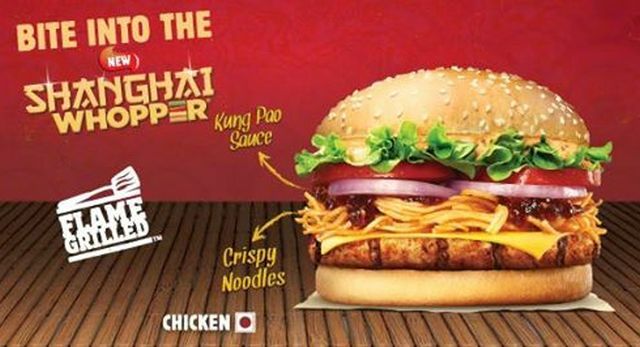 Burger King India's latest burger, the Shanghai Whopper, comes topped with crispy-fried chow mein and Kung Pao sauce to make for a Chinese theme. In addition to the two ingredients, the burger also comes with cheesy jalapeno sauce, tomato, red onion, cheese, and a choice of either a veggie patty, chicken patty, or mutton patty on a sesame seed bun. Kung Pao sauce is traditionally made with shaoxing wine, chilies, and Sichuan peppercorns, and is a component of Kung Pao chicken. Crispy chow mein is typically a dish of its own (and not a part of Kung Pao chicken) and comes topped with gravy, vegetables, and meat (or seafood). 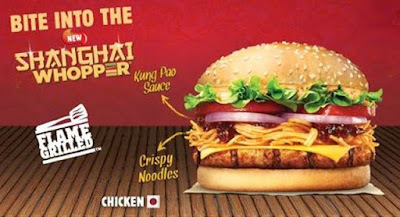 The price for the Shanghai Whopper varies with patty choices. It's 159 rupees (~$2.38) for the veggie patty, 169 rupees (~$2.52) for the chicken version and 229 rupees (~$3.42) for mutton. Beef is usually not offered in India due to a large percentage of Hindus in the population. Photo via Burger King India.